Young Flora is happy to leave the orphanage behind and join her aunt and uncle, even though it means working at a textile mill where there is the constant threat of being injured or going deaf. She writes about her feelings in her diary, addressing her father and mother who died when she was five. Then her uncle loses several fingers at the weaving machine leaving him unable to work, and money is very tight. Can Flora help her aunt and uncle survive? I am at home even though it is the middle of the day. I had an accident at the mill. I had crawled under the machine to twist a broken thread when a mouse ran over my bare foot. (I take my shoes off to save them.) It startled me so much that I sat up sharply and hit my head hard on the machine. Next thing I knew was Auntie Janet's face close to mine and blood on my pinafore. I knocked myself out under there and the only way they could get me out was to drag me by my feet. My head was bleeding where I cut it and my face was scraped from the floor. The doctor came and bandaged me up. Then Auntie Janet walked me home. I wasn't very steady at walking and I vomited twice in the gutter on the way. I feel terrible to be such a bother. I know it is not sensible to be scared by a mouse. Mr. Haskin was mean about letting Auntie Janet off to bring me home, even though Agnes said she would mind Auntie Janet's machine. My head hurts in two different ways. The pain all over comes in waves and on my face it burns all the time. But mostly I am so sleepy. I wanted to go to work today, but when I got up the world was still tipping back and forth. So Auntie made me stay home. Mungo was happy about that. I have a big lump on my head. Uncle calls it a goose egg. Auntie told me that on the way home yesterday I just kept asking, over and over, "Have I spoiled my pinafore?" 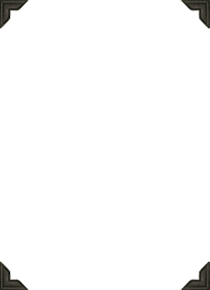 I don't remember that at all. The not remembering is frightening. This morning Uncle James collected my pay, which was not very much because of missing two days. Auntie Janet lost two hours for taking care of me yesterday. That made Uncle angry, but she said, "They're not likely to be paying me if I'm not working, James." Auntie and Uncle can disagree about something without getting one bit angry. I wonder if that is another family thing. From Dear Canada: Days of Toil and Tears, copyright © 2008 by Sarah Ellis. 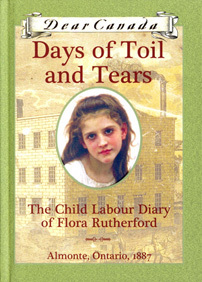 I thought that Days of Toil and Tears really gave us a window into the horrors of Child Labour in the late 1800s. Now I know how horrifying it must have been to be a mill girl, and I am so glad that child labour doesn't exist anymore, as I would not wish the fate of a mill girl upon anyone! This book is very well written. It makes u feel how lucky we are to not have child labour in many countries. I love how it showed not only the downs in life but also the ups. I loved this book and anybody who loves book would love this one! GREAT! All I can say is: I LOVE THIS BOOK! I love this book soo much!!!! It is sad when Flora's uncle has the mill accident. This was a wonderful book. It was filled with sadness, adventure, and joy. I read it over and over. It was the best Dear Canada I've ever read! Loved this book, I read it three times so good and Sarah Ellis was super nice when I met her. A true tale of endurance, hope and courage. Flora is truly the ultimate heroine and is full of energy bravery. She is so easy to love you'll never put the book down! I'm about three-quarters the way through Days of Toil and Tears, and I loooove it! Flora seems like such a sweet person; I'd totally be friends with her. Her descriptions were mind-blowing! I found her uncle a little selfish towards the end, though.